Have you ever wondered how we pick a pack of beautiful fabrics that work together? I thought it’d be interesting to show you how we do it. 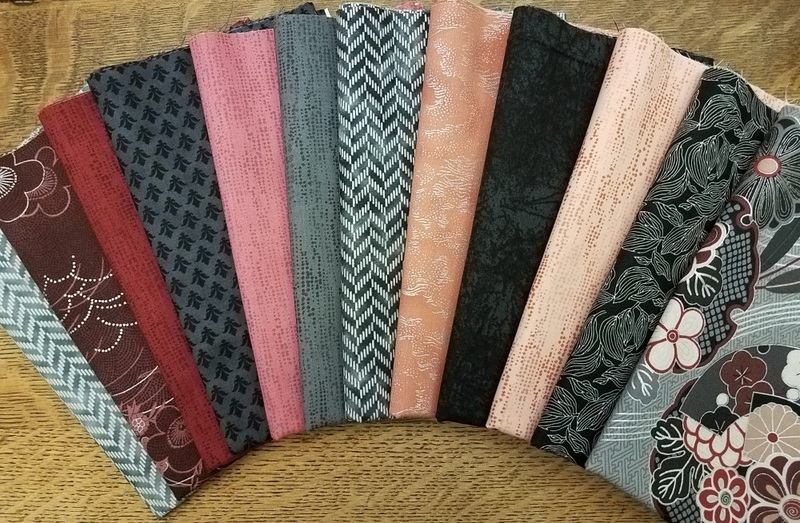 When Becky got here, we had gotten in a rather large shipment of Hoffman fabrics which for the most part, still are not on the site, but are gradually getting there, either in packs or yardage or both. 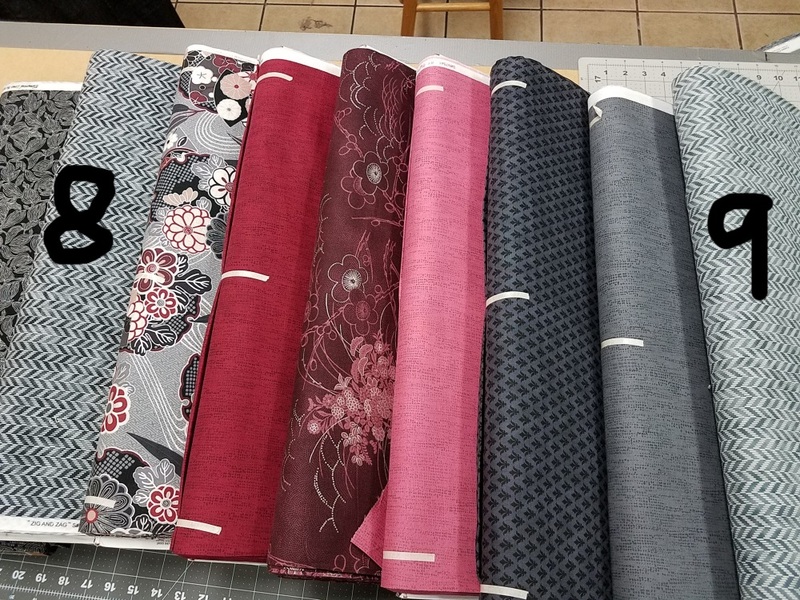 But, I needed her to use the fabrics NOT yet up on the site, so I didn’t have to worry about anyone having ordered the fabrics that we were using in the packs! So, I thought that I’d show you what she did in pictures! 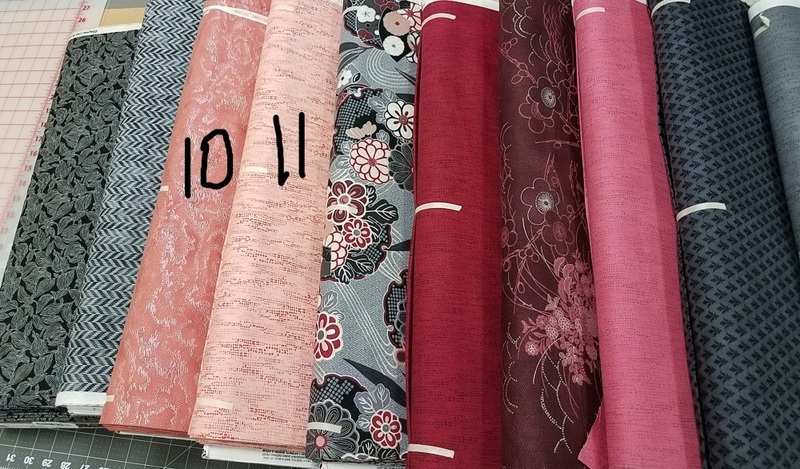 In my own attempt to do this last week, I had previously located, in addition to the two feature fabrics, a beautiful gray. But that was it. At that point, all of the previous work for Becky was completed. She was on her own. I left to go and do something else. I was curious to see what she’d find in my little “store” of fabrics not yet up on the site. So Fabric number three was the gray shown below. Then, she thought, “I need more black to go with this beautiful fabric, so she found numbers 4 and 5, all blacks or blacks and whites, to go. Then, she thought, “I need more color. Let me look around. After the grays and blacks, she decided to add the reds and rosy pink that went beautifully with the feature fabrics! Then she explained to me that she found these two grays that looked beautiful with the collection of fabrics that she had gathered... The one on the right is a lighter gray (#8) and the one on the left is a darker gray (#9) . Even though the pattern is the same, it still works. Then she decided that she needed to add in a darker black that is not entirely black. So, here’s the black-black that’s a perfect conclusion to this pack. She said that you all should order extra of this black, so I’ll put all the links below. Here you have it.. all cut and folded and ready to be bagged! You can order Elegance HERE. Get Extra Black HERE. Now, let’s see what beautiful things you all can come up with the beautiful pack that Becky has picked out! I wish I could reach out and let you see and feel this fabric in person. it’s about 1000x prettier in person than in the pictures… I’m afraid, however, if I say too much you won’t want to get it because you’ll think it’s too pretty to cut up!